Flip a coin. 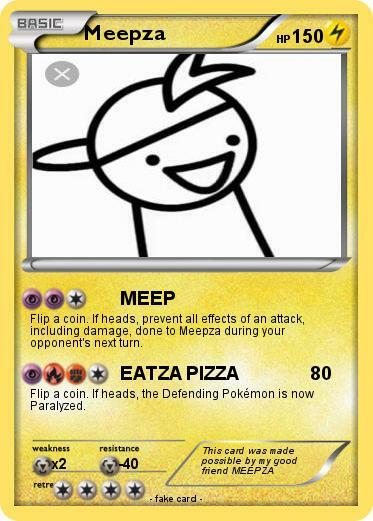 If heads, prevent all effects of an attack, including damage, done to Meepza during your opponent's next turn. shadow lugia 3333333333 | krabs | Pansage | Luade and Gucario | Adrian 211 | bye mega | Where's my donut? | Ash Ketchum | dialga | supa sonic | Alex's Charizard 9999 | Santa | GOKU | Dark Wolf Link | anthonymon | Hammer Kirby LV 70 | cm punk | shy guy | mario brothers (combined) | The Annoying Orange!